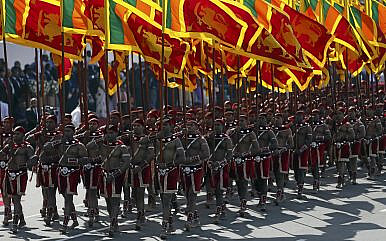 Members of the Sri Lankan military march with national flags during Sri Lanka's 68th Independence day celebrations in Colombo (February 4, 2016). Based on Australia’s Defense White Paper, the two countries can deepen strategic security cooperation. Sri Lanka and Australia have enjoyed a robust bilateral relationship for more than six decades, since the two countries established diplomatic relations in 1947. Historical records show people-to-people connections between the two former British colonies date back much earlier, to at least the late 19th century. Moreover, the two countries have cooperated in several multilateral forums over the years, including in the Commonwealth and the Colombo plan and, more recently, in the Indian Ocean Rim Association and the ASEAN Regional Forum. While bilateral relations have evolved in several areas – including migration, higher education and sport – there is untapped potential to expand the broader strategic cooperation between the two countries. The economic promise of the Indo-Pacific region, combined with growing concerns about the security and stability of this region, point to an opportune time to enhance strategic cooperation. Australia’s recently released Defense White Paper 2016 offers a basis on which to expand such cooperation, moving beyond its present focus on people smuggling between the two countries and toward a broader, rules-based relationship that accounts for regional opportunities and challenges. Currently, Sri Lanka-Australia strategic relations revolve around one particular aim: the prevention of people smuggling. Sri Lanka and Australia have formed a Joint Working Group on People Smuggling and Other Transnational Crime toward this end, and also cooperate on the issue multilaterally via the Bali Process. This cooperation was strengthened when the Australian government gifted two Bay-class vessels to the Sri Lankan government in 2013, to increase the Sri Lankan Navy’s capability to intercept people smugglers in Sri Lankan waters. While certain politicians and human rights activists have raised concerns over elements of this cooperation, it remains the mainstay of bilateral strategic cooperation. Both the Australian and Sri Lankan governments have made public statements to that effect. However, it is possible that Sri Lanka and Australia could forge bilateral engagement over a wider variety of strategic issues. Australia’s 2016 Defense White Paper provides some indications of how this might be done. Australia recently embarked on a comprehensive stocktaking exercise with regards to its defense policy, which culminated in the release of the Defense White Paper 2016. As this White Paper outlines Australia’s defense policy direction until 2035, it provides a context for examining potential areas to strengthen Sri Lanka-Australia strategic cooperation. A secure and resilient Australia, dealing mainly with border security. A secure nearer region, encompassing maritime Southeast Asia and the South Pacific. A stable Indo-Pacific region and a rules-based global order. The Sino-U.S. relationship in the Indo-Pacific region. Challenges to the rules-based global order, stemming from competition between countries and major powers. Terrorism, particularly from foreign and returning terrorist fighters. State fragility caused by uneven economic growth, crime, governance challenges and climate change. The introduction of new non-geographic security concerns, such as cyber threats. All of these security drivers are discussed in the White Paper in relation to one or more of the strategic defense interests listed above. All except the last security driver (non-geographic security concerns) are considered in relation to the strategic defense interest of a stable Indo-Pacific region, while non-geographic threats are primarily discussed in the context of the strategic defense interest of a secure and resilient Australia (i.e., of maintaining border and internal security in Australia). Each of Australia’s strategic defense interests – and some of the security drivers associated with them – contain areas of convergence with Sri Lanka’s strategic interests, thereby signaling potential areas for bilateral strategic cooperation. The first strategic defense interest, “a secure and resilient Australia,” deals primarily with the security of Australia’s borders and its offshore territories. While the concept covers a wide range of security issues ranging from cyber attacks to home-grown terrorism, the most relevant area for potentially expanding Sri Lanka-Australia relations are first, the protection of maritime resources and second, combating maritime criminal networks. With regard to the protection of maritime resources, the Defense White Paper specifically mentions Australian fisheries and how they could become a target for illegal long-range fishing fleets. Sri Lanka already faces illegal fishing challenges on a significant scale. In particular, Indian trawlers in Sri Lankan territorial waters have become a recurring irritant in bilateral ties with India. Unsustainable fishing practices such as bottom trawling have also placed Sri Lankan fisheries resources at risk. Given the importance for both nations to protect offshore maritime resources, Sri Lanka and Australia might benefit from increasing their bilateral cooperation on fisheries related issues. Sri Lanka, in particular, could benefit from Australia’s experience in handling illegal fishing by Indonesian fishermen in its northern waters. Sri Lanka and Australia could also strengthen their cooperation on this issue by lobbying for rules-based responses to illegal fishing. This cooperation could be developed by using UNCLOS as a framework. The other relevant aspect for Sri Lanka-Australia strategic relations in the context of border protection is the prevention of maritime crime. Cooperation already exists on this issue, but could be further strengthened through joint military exercises, knowledge exchanges, and the provision of military hardware. For example, the Australian government’s Pacific Patrol Boat Replacement Project is currently providing newer versions of Australia’s Pacific-class Patrol Boats to certain South Pacific countries. Sri Lanka could better cooperate with Australia in deterring maritime crime if such modern military hardware were similarly made available to its naval forces. Committed as Sri Lanka and Australia are to curbing maritime criminal networks, a purely military approach would likely be insufficient in addressing this issue. Therefore, the two countries also have room to cooperate in developing rules-based responses. Both countries have already opted for such an approach, as is clear from their membership in the Bali process and a (MOU) MoU on Legal Cooperation against the Smuggling of Migrants, signed in December 2009. This commitment could be further developed by supporting the broader application of rules-based frameworks to combat maritime crime, such as the UN Convention against Transnational Organized Crime (UNTOC). The second of the strategic defense interests identified in Australia’s Defense White Paper — i.e. a secure nearer region — focuses on traditional areas of Australian influence in Southeast Asia and the Pacific. One of the key features of this second strategic defense interest is its focus on Australia’s security partnership with certain neighboring countries, such as Papua New Guinea, Timor-Leste, and the Pacific Island states. In particular, Australia’s partnership with Pacific Island countries should be considered in the context of the “state fragility” security driver. The White Paper states that factors such as population growth, political instability, and environmental degradation could affect these small states. It makes specific mention of climate change as a major challenge for these and other countries in Australia’s immediate vicinity. The White Paper proposes to enhance Australia’s naval and amphibious capabilities, in order to provide better disaster relief and stabilization of the region. While Sri Lanka has no comparable security involvement in neighboring countries, the Maldives, Sri Lanka’s neighbor, shares many features with Pacific Island countries. The most prominent such feature is a marked vulnerability to climate change and related natural disasters. The substantial people-to-people links between Sri Lanka and the Maldives could require Sri Lanka to assume a more involved and responsible role, if the situation in that country deteriorates further. Given that the former Maldivian President Mohamed Nasheed had considered Sri Lanka and Australia as potential sites to relocate the Maldivian nation in the event of it being submerged by rising sea levels, both countries have reason to cooperate on this issue. As with other strategic issues, knowledge exchanges would help. In addition, it would be advantageous if Australia could provide financial and technical assistance to Sri Lanka so that it possesses adequate capacity to deal with the socioeconomic shocks emanating from climate change in the Maldives (especially a possible influx of Maldivian refugees). Given that Australia is now taking a global leadership role regarding climate change via its participation in the Green Climate Fund, there is an opportunity to advance strategic cooperation on climate change issues. The final strategic defense interest — a secure Indo-Pacific region and a rules-based global order — considers a vast region extending from East Africa to East Asia and the South Pacific. The Sino-U.S. relationship in the Indo-Pacific is unsurprisingly mentioned in the White Paper as the most important security driver affecting this strategic defense interest. Given Australia’s long-standing strategic partnership with the United States, the Defense White Paper strongly supports the United States’ continued engagement in the Indo-Pacific region. However, it simultaneously welcomes China’s economic growth as well as the opportunities it provides for Australia and other Indo-Pacific countries. The White Paper emphasizes the importance of rules-based frameworks in addressing points of friction between the two powers in the Indo-Pacific (such as in its support for the ASEAN-China Code of Conduct for the South China Sea). It also emphasizes certain normative principles as important to realizing the economic potential of the region; for example, freedom of navigation and unimpeded trade. In summary, the White Paper sees normative frameworks as a means to achieving the narrower national interest of “balancing” the strategic alliance with the United States with increasing economic engagement with China, and also to achieving the broader regional interests of political stability and unimpeded trade. Australia and Sri Lanka certainly have common interests in addressing the tensions of the Sino-U.S. relationship in the Indo-Pacific region. Like Australia, Sri Lanka welcomes stronger engagement with China, focusing mainly on economic engagement but also extending to cultural and people-to-people engagement via higher education, tourism, and the arts. While Sri Lanka does not have a strategic alliance with any one particular country, it is mindful of the need to maintain the goodwill of several strategically important nations, including India, the United States, and China. In addition, as two nations that border ASEAN, Australia and Sri Lanka share a crucial interest in the safety and non-interruption of sea lines of communication within this region. Given the limited strategic capability of both countries vis-à-vis the major powers in the region — primarily, the U.S., China and India — relying on rules-based frameworks is the most attractive option for both Australia and Sri Lanka to secure their interests. Like Australia, Sri Lanka has already displayed a preference for rules-based order in the Indo-Pacific. As Australia and Sri Lanka have shared interests and have already articulated similar sentiments on the South China Sea dispute, there may be scope for strategic cooperation – through the adoption of common positions based on established rules and principles, which emphasize the importance of freedom of navigation in the area. In addition, as participants at the ASEAN Regional Forum, Sri Lanka and Australia could further cooperate in lobbying for stronger regional security architecture for the Indo-Pacific. In this regard, Sri Lanka could perhaps do well to stand with Australia in supporting the ASEAN-China Code of Conduct for the South China Sea. In addition to existing cooperation on combating maritime crime, Sri Lanka and Australia could also cooperate on the issues of illegal fishing; developing resilience to climate change and its impact on vulnerable neighbors; and maintaining peace and stability in the Indo-Pacific by emphasizing freedom of navigation. Possible cooperation on these new areas could cover technical assistance, training and knowledge exchanges, and joint lobbying at multilateral forums. A common advocacy of rules-based frameworks could help to secure both countries’ national interests. Sri Lanka and Australia already have strong bilateral ties, based on trade and membership in the Commonwealth, as well as enduring people-to-people links through migration, higher education, and sports. Their strategic relations, which have in recent times focused on a single issue, could expand and thrive with greater recognition of shared interests and an appreciation of a rules-based global order. As both countries confront similar and increasingly challenging security issues, there is scope and urgency for strengthening their strategic cooperation. Barana Waidyatilake is a Research Fellow at the Lakshman Kadirgamar Institute of International Relations and Strategic Studies (LKI). The opinions expressed in this article are the author’s own views. They are not the institutional views of the Lakshman Kadirgamar Institute, and do not necessarily represent or reflect the position of any other institution or individual with which he is affiliated. A version of this article was presented at a Roundtable on Sri-Lanka Australia Relations hosted by the LKI on July 11, 2016 with the participation of the Australian Institute of International Affairs Victoria, the Ministry of Foreign Affairs in Sri Lanka, the Australian High Commission in Sri Lanka, and the Center for Poverty Analysis in Sri Lanka, and benefited from the comments of participants at that Roundtable. All errors and omissions remain the author’s.